Wedding reception in Kossove Terrace Tonight! Tonight is a first for the Kaminski House Museum. We are having the inaugural opening of the Kossove Terrace tonight for a wedding reception. It is a fabulous space and we anticipate that it will become a premier location for receptions and other festive events. The Kaminski House Museum has partnered with amazonsmile for an exclusive offer on Thursday, March 16 Only. Today amazonsmile is donating 10 times the everyday 5% donation rate for purchases made on smile.amazon.com. to shop at amazonsmile simply go to smile.amazon.com from your web browser on your computer or mobile device. On your first visit to amazonsmile, you can select Kaminski House Museum as your charitable organization. Then shop online and the AmazonSmile Foundation will donate 5% of the purchase price from all eligible amazonsmile purchases. Get started at smile.amazon.com/ch/57-098147. Mythological Character - Do you know who this is? Do you know who this mythological Greek beauty is? 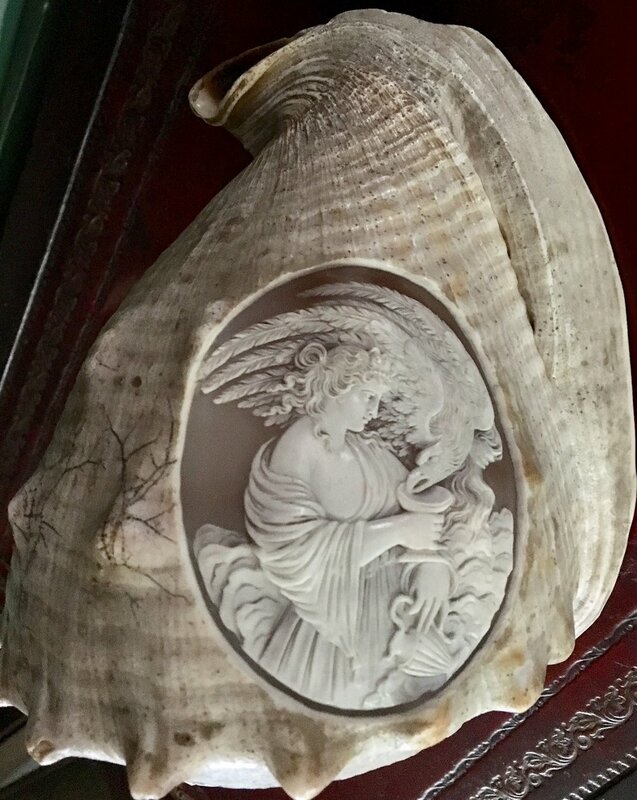 Her cameo is carved into a large conch shell which resides in the Kaminski House Museum's library. This item is but one of the many treasures to be found in the museum's extensive collection. The terrace garden on the riverside of the Kaminski House Museum has been renamed the Kathryn and David Kossove Garden. The Kossoves paved the way for the Friends of the Kaminski House Museum to make improvements to the terrace garden during the summer and fall months of 2016. A donation from the couple allowed the Friends to match dollars generated from a Capital Campaign to improve and upgrade the garden area. The terrace will greatly enhance the museum's ability to use the space for public programs and rental events. The Kaminski House Museum will be the site for a Flag Pole Dedication Ceremony on Wednesday, December 7, 2016. The ceremony will take place at 1003 Front Street at 11 a.m. This event also marks the 75th Anniversary of the bombing of Pearl Harbor and honors the service of Lt. Commander Harold Kaminski who was stationed in Pearl Harbor the day of the attack. Decorated by Rebecca Ceron Martin, the Kaminski House dining room is all decked out for a festive feast! A Very Fashionable Christmas! Having A Ball! has scheduled its second Candlelight Open House on Saturday, November 26th from 5:30 - 7:30 p.m. View the Kaminski House Museum decked out in holiday glitz and glamour created by talented, local designers. Tickets are $10 for members and $15 for non-members. Pick up your tickets at Ricebirds, Bienvenue Home or the museum's shop. Visit our website at KaminskiMuseum.org or call 843-546-7706 for more details. A first for the Kaminski House Museum today - we had our first virtual field trip! Staff members Lisa Stalvey and Robin Gabriel gave a virtual tour of the Kaminski house to the St. Stephen Elementary School (Berkeley County) second graders. Organized by teacher Jennifer Tran, the field trip allowed the students to see the first floor of the Kaminski House as part of their curriculum on SC History. Congratulations to Ashley Kemp and Harry Dixon on their Wedding Day! On behalf of the Kaminski House Museum board, staff and volunteers, we would like to extend our best wishes to Ashley Kemp and Harry Dixon on their Wedding Day! The couple said their vows under the oak tree behind the Stewart-Parker House. The reception was held on the lawn of the Kaminski House Museum. It was a beautiful afternoon! If you have a "passion for fashion" you don't want to miss Melissa Levey's Wedding Gowns Through the Years" presentation at the Stewart-Parker House on Friday, November 18 at 12 noon. Melissa is an avid collector and has an amazing collection of wedding gowns. The price for the lecture is $10.00 and a bag lunch is also available for $8.00. For more information contact the museum shop at 843-546-770. Candlelight Open House This Weekend! A Very Fashionable Christmas! Having A Ball! has scheduled its first Candlelight Open House on Saturday, November 12 from 5:00 - 6:30 p.m. View the Kaminski House Museum decked out in holiday glitz and glamour created by talented, local designers. Tickets are $10 for members and $15 for non-members. Pick up your tickets at Ricebirds, Bienvenue Home or the museum's gift shop. Visit our website at KaminskiMuseum.org or call 843-546-7706 for more details. Tickets Are Now on Sale for A Very Fashionable Christmas! Having A Ball! The Kaminski House Museum presents A Very Fashionable Christmas! Having A Ball! on Monday, November 9 - Friday, December 30, 2016. The museum in historic Georgetown, SC will feature local designers dressing the museum in holiday decor ranging from traditional Christmas decorations to seasonal glitz and glamour! Tickets for the Candlelight Open Houses are on sale at Bienvenue Home, Ricebirds and the museum shop, Julia's. Tickets are $10 for members, $15 for non-members, and children under 12 are admitted free of charge. Check out our website at KaminskiMuseum.org or call 843-546-7706 for more information. After the bridge2bridgerun on Saturday morning, come out to enjoy the Kaminski House Museum's Family Fun and Literacy Day on the museum lawn from 1 - 5 p.m. We will spend the afternoon listening to local storytellers, making cornhusk dolls and playing games out on the lawn. We are featuring healthy treats and even a Spirited Pumpkin Patch! Come back on Sunday for Jazz Under the Oaks from 2 - 5 p.m. This event will offer a Wine Tasting and A Sweets Tent. The events are free. This Weekend, It's All Happening on the Lawn of the Kaminski House Museum!